'Azur et les Aéroplanes' is a theatre mask company. All this has been done by calling on the mask. In theatre, the Mask is a sculpture as much as it is a character. One does not wear a Mask thoughtlessly but with lightness and precision. We wil mask them all! 'Azur et les Aéroplanes' has chosen to explore the infinite and extraordinary fields of the mask as well as puppetry and other dramatic sculptures, genuine instruments at the service of the stage and the performance. The company leads professionals to explore new territories in dramatic arts. 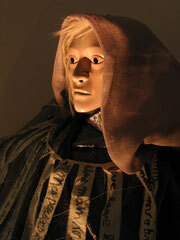 -'Sculptors of stories': Mask and puppets design at the service of theatre companies. To know more, click here. -A show, 'A day, the night': an antic tale adapted with contemporary style. - 'Masks & Co.' workshop: training courses in dramatic arts (masks & puppets) for everyone and professionals.